Parishioners will be interested to learn that all available magazines of this parish are now permanently bound. The Parish Magazine of West Hallam seems to have been issued first in January 1860, by the Revd C J Newdigate and continued until December 1863, when it appears to have lapsed. It was revived by the Revd C W Birley in January 1901, and has continued in different forms from then until now – sometimes being reduced to a mere leaflet and on one occasion appearing quarterly. These magazines are a wonderful resource for anyone researching family or the history of West Hallam and Mapperley. A few years ago, following research for my website and as then Editor of this magazine, I decided to update the archives. The Derbyshire Record Office in Matlock already held magazines from 1860 (minus some years when it wasn't produced). 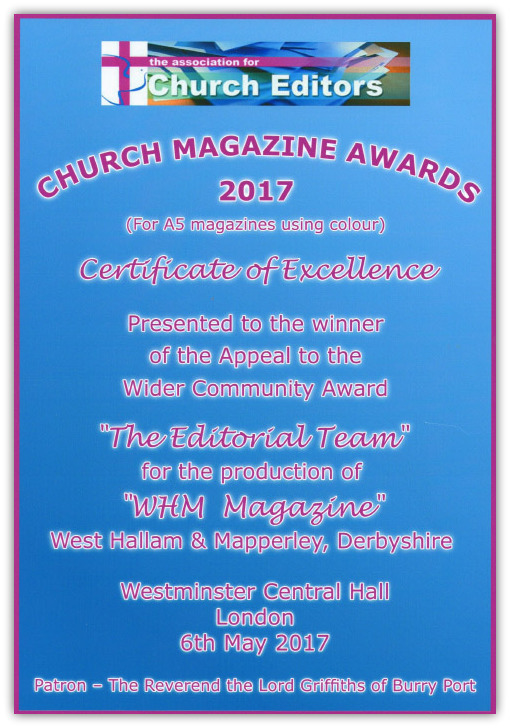 I found an interesting article in the Nov 1999 magazine that Revd Ken and Mrs. Ann Vorley had funded the binding of parish magazines produced in their ministry of West Hallam; Ken was Rector from 1971 to 1977. This started me out on a journey that I had no idea would be achievable or not. My aim was to find magazines from 1978 to the present day. What a task. I advertised in this magazine and the response was remarkable. People contacted me who said they had boxes full of them in their lofts and some just had a few tucked away. Remarkably, with our readers help, I was able to obtain a magazine for every month of those 34 missing years from 1978 up to the 2012. In fact, the response was so good that I was also able to make files of the spare copies to be kept in West Hallam Rectory. I also have more copies in my garage which I constantly refer to for my website. I approached West Hallam Parish Council for financial support to purchase binders, which they kindly agreed too. I still continue to retain copies and, although no longer the magazine editor, the committee provide me with extra copies especially for archiving purposes for which I am very grateful. The Rectory also keeps my files up to date there and Ms Ainsworth also receives a copy which she kindly files at Ilkeston Library. Matlock now have all copies up to 2018. The ref is D1224. The binding and archiving continues and will hopefully do so in the years to come. Happy researching! If you live in West Hallam or Mapperley please place an order for this very interesting magazine to be delivered to your door. We are a monthly magazine which is 36 – 40 pages of news and events in our area. Monthly reports are included from many of our local groups and organisations. Craft Group, Ladies Coffee Club, WI, Flower Club, Gardening Club, Wine Appreciation Society, West Hallam Parish Council, Mapperley Parish Council, West Hallam Village Pre-School, Community Pre School, Methodist News, Friends of Straw’s Bridge, 10th Ilkeston Scout Group, Bramble Lodge News, Mapperley History news, West Hallam Rural and Walking Society, West Hallam History news, WHAC and all Services and News from St Wilfrid’s church and Holy Trinity church. Local businesses advertise their services so you have easy access to local traders. Upcoming events are advertised so you never miss out on what is happening. There is always a lot for you to enjoy. Obtaining a copy of this magazine could not be easier.